Understandably, 2010 is going to see far more companies consolidating what they do well rather than blazing new trails. Tibor Reels announced its biggest new product addition back in the spring (due largely to popular demand, according to company reps). 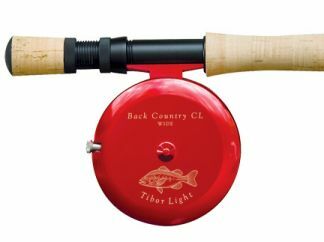 When the Tibor Spey series (pictured) was introduced at the Fly Fishing Retailer Show last year, it was available only in a 11-15 weight model. In March, the 8-10 weight size debuted and has already begun to trickle out to fly shops. 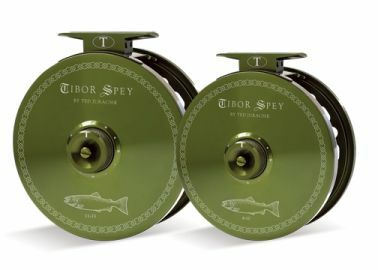 Tibor Spey reels are laser-etched (this differs from the painted anodization process used by other companies), and have the huge capacity necessary for spey fishers to hold their bulky lines and balance their long rods. Meanwhile, Tibor will also be adding a new design to its popular series of fish engravings: the Freshwater Bass. Tibor’s fish drawings are handcrafted exclusively for their reels and have to be drawn multiple times in order to be custom-matched to the various anodizations they offer. Have a favorite Tibor reel? Let us know in the Comments section!